Why Does Plant Diversity Matter? Help Us Figure It Out! How important is plant diversity in restored prairies? Are diverse prairies more resistant to drought and invasive species than less diverse prairies? How does plant diversity influence invertebrate communities and their ecological functions? These kinds of questions have been the focus of multiple research projects in our Platte River Prairies over the last decade or so. We have numerous restored (reseeded) and remnant (unplowed) prairies that provide excellent field sites, and have also established two sets of experimental research plots to help focus specifically on questions related to plant diversity. Those plots are 3/4 acre (1/3 ha) in size and represent varying levels of plant diversity, allowing us to investigate the functional differences between them. Researchers from the University of Nebraska, Kansas State University, the University of Illinois, and Simpson College have been involved in data collection efforts so far. 2013 photos from our experimental research plots. The plots from left to right were planted to a monoculture (big bluestem), a low diversity mixture (mostly grasses and a few late season wildflowers) and a high diversity mixture (100 plant species). We are investigating functional differences between these kinds of plant communities. Craig Allen, Leader of the Nebraska Cooperative Fish & Wildlife Research Unit, and I are hoping to take the next step in these efforts by bringing on either a PhD or Post-Doctoral Research Associate. We have data to build upon, including some intriguing results regarding invasive species and insect herbivory rates at varying levels of plant diversity, but want to greatly expand upon those data. If you or someone you know is interested in these kinds of questions, please read below and contact Craig or me with questions. Ph.D. graduate research assistantship or Post-Doctoral Research Associate. Available starting in May 2015, to investigate the relationship between grassland restorations and ecosystem services and resilience. The assistantship (or Post-Doc) is with the Nebraska Cooperative Fish and Wildlife Research Unit, in the School of Natural Resources at the University of Nebraska, working closely with the Nature Conservancy scientists and resource managers. The research project will include a synthesis of literature to identify prominent knowledge gaps related to the restoration of grasslands and resilience. In addition to synthesis, field work will occur on a suite of restorations in central Nebraska. Some questions of interest are listed below, but ultimately, successful candidates will be expected to develop a specific research project(s). The candidate could approach this project from a broadly ecological, or botanical, or entomological frame. The successful applicants will be highly motivated, with a strong work ethic, strong and demonstrated writing skills, a passion for field work, and the ability to work in collaboration. Experience in restoration ecology is helpful, but not required. Ph.D. applicants should possess a M.S. in Wildlife, Biology, Zoology, Botany, or Entomology, or a related field and have a valid driver’s license. Post-doctoral applicants should possess a Ph.D. Relationship between restoration diversity and ecosystem services, such as invasion resistance and herbivory; interactive effects that might mediate some resilience properties; responses to multiple disturbances; how invasions might weaken the ability to cope with disturbance; microbial diversity and ecosystem function and services; response to pulse and press disturbances and mechanisms driving responses; functional trait diversity and redundancy and resilience. Why is plant diversity important? I can come up with lots of reasons, including the value to pollinators, correlations between plant and insect diversity, and contributions to ecological resilience – among others. But it’s much more difficult to quantify the specific functional differences between high-diversity and low-diversity prairie plantings. Even basic questions are difficult – for example, how many plant species does it take to see benefits? Most of us who spend time in prairies know intuitively that plant diversity is important, but if we’re going to influence environmental policy, agricultural practices, and other large-scale conservation strategies, we’re going to need stronger and more quantified answers than intuition provides us. In an attempt to help find some of those more specific answers, we have built some research plots within our Platte River Prairies, in which we’ve established prairie plantings of various plant diversity. Each treatment plot is 3/4 acre (1/3 ha) in size – big enough that we hope to compare patterns of invertebrate species composition and activity, soil changes, differences in the resistance to invasive species, and more. We’ve actually established two sets of plots now; one in 2006 and the second in 2010. 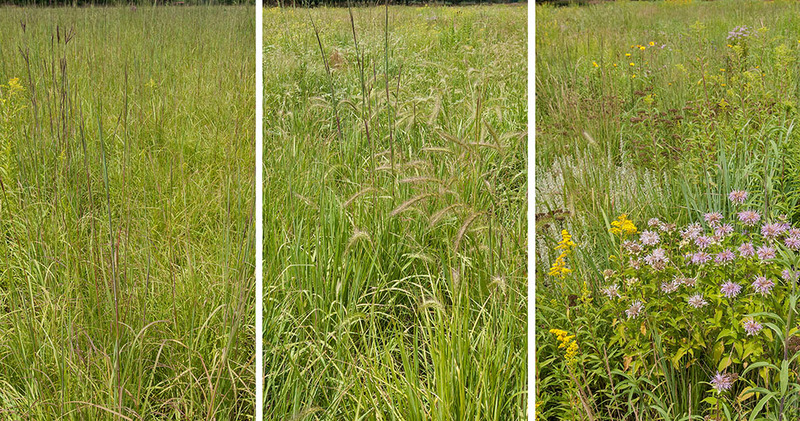 The 2006 set consists of low diversity (15 species) and high diversity (100 species) plots, and the 2010 set consists of three treatments: a monoculture of big bluestem, low diversity (mostly grasses, with a few forbs), and high diversity (100 or more plant species). Each treatment is replicated at least 4 times. Clint Meyer, of Simpson College (Iowa), was out last week doing some sampling of ground-dwelling invertebrates. 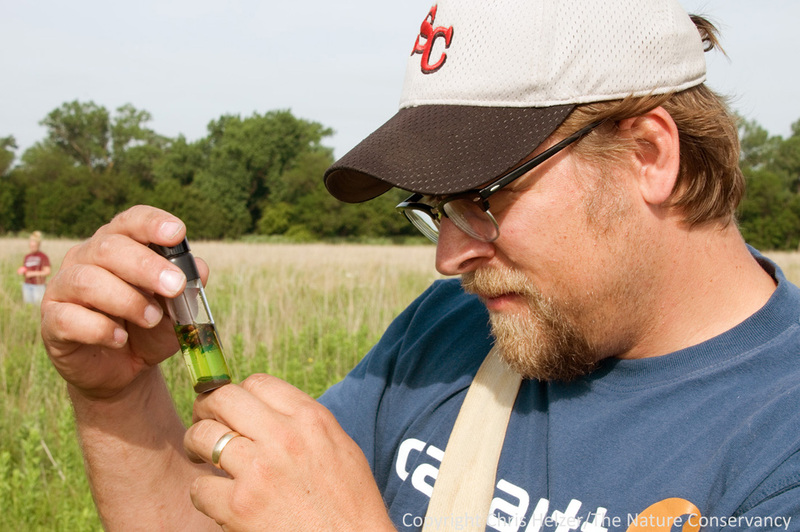 Here he examines insects caught in a pitfall trap within our 2010 diversity research plots. 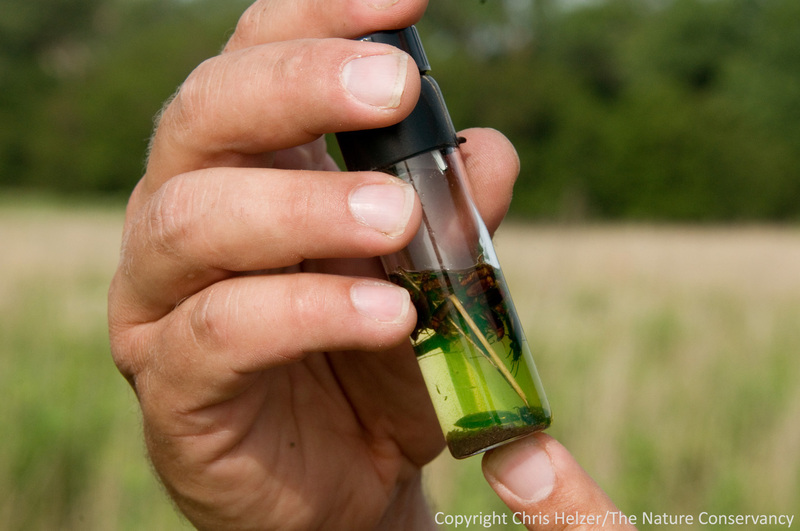 A close-up view of a vial of insects caught in a pitfall trap. There are least two species of ground beetles in the vial (floaters and sinkers!) as well as springtails (the little specks floating in the lower left hand portion of the vial).